Drill to improve short space and wide space overlap play. Players line up in 3s opposite sides of the grid. Simple 3 v 2, with two defenders with tackle bags. 3 players, 1 ball, 1 pad. Moving the ball along the line this play sees 11 run up behind 10 to support the line and blind side the opposition. Put pressure on attacking side. The box kick is a very dangerous tactic for attack and defense. Use the diagram in order to think about the starting position of your players, I suggest that they are not too deep for this one. 10 advances with the ball, running slightly inwards. 10 changes the angle of their run, towards the first post. Use the diagram as suggested starting positions, but be flexible. 10 carried the ball forward, inviting the defence to press up. 11 runs a decoy line. Drill to practice catching high kicks. Set up a grid roughly 15m long and 10m wide. A drill to practice decision making and finding space between defenders. 10 loops around behind 12. 10 moves forward carrying the ball. 10 passes to 13, missing 12. See the diagram for starting positions. See the diagram for the starting positions. See the diagram for the suggested starting positions. 12 moves forward, cuts in. 11 provides a decoy run. 11 could provide a decoy run. Working on basic hands this play sees your line passing the ball, missing out 11 and passing to 15 as they join to support the line. 10 advances with the ball. 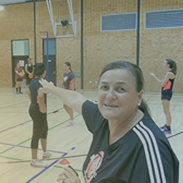 The aim of the drill is to develop players speed of pass. 2 players working together, about 4m apart. One player punt kicks the ball to the hands of the other. When the attack advances the defenders PRESS UP on the attack. Use the diagram to highlight suggested starting positions. 12 advances, as does 13. 10 advances with the ball, then cuts in. Break your players into two teams. One team goes to attack, and one to defence. There is no kicking in this game. The aim of the drill is to develop strong positive profiling with resistance from coach to check for stability and strength. Any number of players can be used. 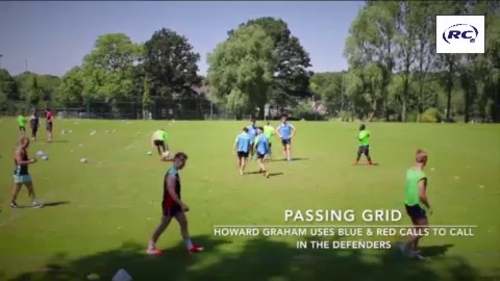 Make the distance between each pass shorter for lower ability groups. 10 and 12 remain static, the other players are in motion, offering options. 10, 12, 13, will be starting very flat with minimal movement. Drill to practice decision making. 10 carries the ball up. This clearing technique is used to remove defenders who have latched onto the ball and are in a low body position. Catching & passing to receiver when under pressure. Fast hands and a cool head will be needed in this physically testing pressure passing session - are your players up to the challenge? Test how your players respond to finding space and passing under pressure, as we move forward with the Rugby season. Work on your players composure when going into contact to be able to provide the offload to create scoring chances even when under pressure. How can I overcome my son's fear of tackling? How can I retain players at the club as they move from teenage to senior status? What's a good 2v3 drill? Blindside position - I'm new to the game and I'm not sure what to do?